If your building has a fire sprinkler system, it’s a wonderful thing to give you peace of mind. If a fire were ever to start, you could expect the sprinklers to do their job and provide a fresh, cool rain of water to drench the fire. However, whenever we start talking about fire sprinklers in Houston, there are always invariably a couple of myths that people believe. In this blog post from MLN Fire Protection, we’d like to debunk some of the common myths regarding fire sprinklers in apartments, commercial buildings, and other businesses and workplaces. 1. The fire sprinkler will go off if the smoke detector does. Your fire sprinklers are made with a trigger that is heat-activated. When the fuse reaches a certain temperature, the liquid in the fuse will expand, bursting the glass and releasing the water to flow out of the pipes. That means that if there is *only* smoke, the fire sprinkler will not activate. If someone in the break room burnt their burrito to a crisp in the toaster oven, you’ll have smoke in the air, but you won’t have to worry about the sprinklers soaking everything in sight. 2. The sprinkler system will soak the whole building if one sprinkler goes off. This happens in the movies, but in real life, sprinkler systems are designed to go off only at the site of the fire. If the fire is contained to one area or one room, that’s the only area that will be soaked. This protects valuable equipment, paperwork, furniture, electronics, and other items from water damage. After all, if you have just a small, contained fire, you shouldn’t have to deal with water damage in the whole building. 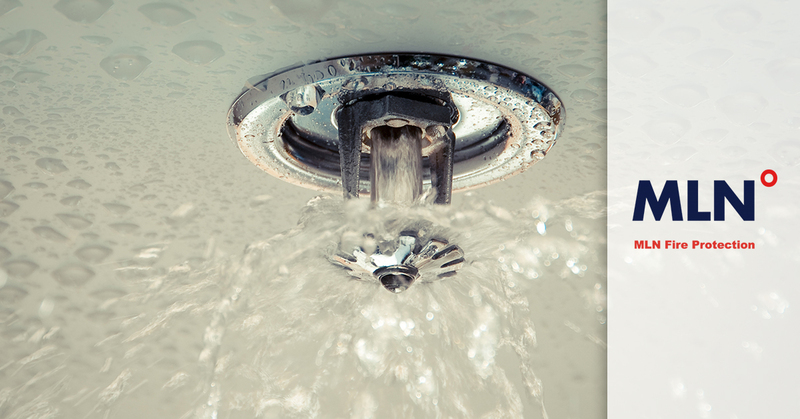 Fire sprinklers are built to balance the risk of water damage against the need to put out a fire quickly and effectively, and the goal is minimize loss and while optimizing fire protection. One exception to this rule is if your building has a deluge system. A deluge sprinkler system will set off every sprinkler head if only one gets triggered. If your building has a deluge system, it would be good to know that so that you can take measures to protect your property from needless water damage if the sprinklers ever go off. 3. All fire sprinklers are the same. Fire sprinklers work on different models and can be set to go off at different temperature thresholds. They can also contain material other than water (such as foam) that will be released if the sprinkler ever gets triggered. Two main types of sprinkler systems are wet systems (most common) and dry systems. MLN Fire Protection is able to install and service any type of fire sprinkler system in Houston and the surrounding areas. Your sprinkler system may be designed to merely contain a fire or to actively put it out before firefighters have the chance to intervene. However, sprinklers DO make a big difference. The water cools the room and makes it much easier for people to escape. Also, the reduction in the fire damage is so great that people in many communities are pushing to make it mandatory to install sprinkler systems in all residential homes. We hope you’ve enjoyed reading these myths about fire sprinklers. For fire sprinkler installation, maintenance, inspection, and service in Houston, contact MLN Fire Protection today!